Southern Counties aerials TV wall mounting service Sussex. Getting your nice new large LCD TV on a wall needs to be done professionally. We’ve installed lot’s of large LCD TV’s on brick and chalk board walls and hidden cables so it’s all neat and tidy. We’ll provide all the fixtures and fittings and do a professional job to a high standard. And, we’ll even connect your DVD or BluRay player, satellite TV system and games console to your television before we go. 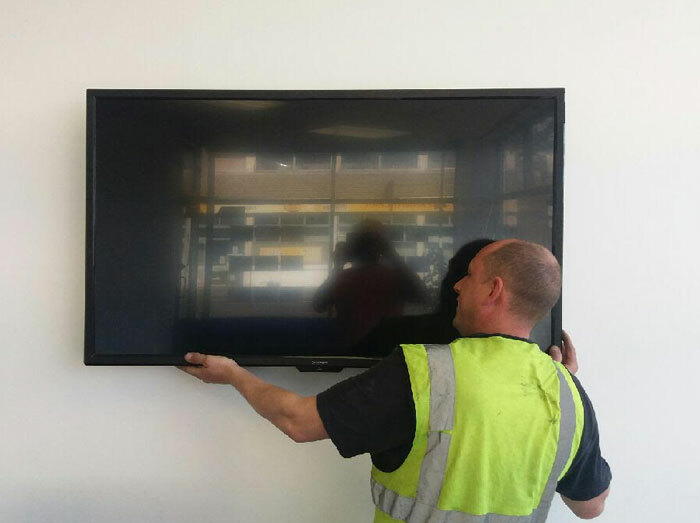 We provide a professional and quality LCD wall mounting and TV installation service throughout Sussex. Whether you need your brand new flat screen TV mounted in your lounge, an innovative solution for your kitchen or bedroom or you are a business that needs several televisions wall mounted, we can help. We’ll come to your home or business and establish the optimum place for your speakers to be positioned. We’ll then install your sound bar or speakers, hide all the wires and cables and connect your TV and sound system to make sure you get the very best quality audio. If you have a new TV and you need an expert to come and install it for you, we’re here to help. We’ll make sure you get the very best picture, deal with all the cables and wires and make sure your DVD or Blu-ray player, games console and digital TV system is fully connected. We have helped lot’s of residential and commercial customers across Sussex. We’ve developed a reputation for superb service and that means when you speak to Southern Counties aerials you are speaking to a professional, reliable and established company who know what they are doing.